In 1970, he was appointed as the first Professor of Māori Studies at the University of Waikato. In 1987 he became the first Māori Language Commissioner at Te Taura Whiri i te Reo Māori. He continued in the role until 1999. From 2003, Tīmoti was the Head of Te Kōhanga Reo National Trust. Tīmoti has been involved in numerous Māori performing arts competitions as a tutor, a composer, a judge and an organiser. He was the head of the national Māori performing arts competition for many years. Tīmoti has received two Honorary Doctorates; one from Victoria University of Wellington and the other from The University of Waikato. He is a Director of Te Panekiretanga o te Reo, a programme established to promote excellence in the Māori language. 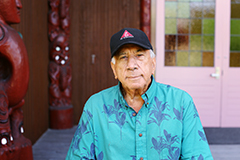 Tīmoti Karetu continues to be a stalwart of the Māori language and is unflinching in his dedication to the Māori language. He is the formost expert in Māori language revitalisation efforts and is a role model and mentor for many in the field of language revitalisation both foreign and domestic.